Click here to see original story in the Athens Messenger. Note: This story appears in the Sunday, April 14 newspaper on Page A1. 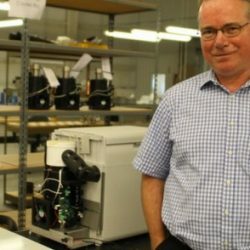 The company, which develops, manufacturers and sells Stirling Ultracold freezers, has been notified that it is eligible for potential grant money and is in the process of completing and submitting a formal application to JobsOhio. That’s according to a statement sent to The Messenger by Nancy Crist, Global Cooling’s vice president on organizational development. “We are delighted with the potential of assistance from the state of Ohio to expand the capacity at our world-class manufacturing facility in Athens,” stated Neill Lane, president and CEO of Global Cooling, in a news release. According to the statement sent by Crist, Global Cooling is investing heavily in new products, manufacturing capacity, facility improvements and organizational growth. The statement from Crist says the general growth and investment plans were presented to the Athens County Port Authority, which referred Global Cooling to JobsOhio as a possible source of funding. Crist and Tim Dannels, chief operating officer of Global Cooling, met with the Port Authority in February. Although specifics of the plans may have changed since then, the Port Authority’s meeting minutes give an indication of what the company was considering at that time. According to the minutes, the company has work related to production of its freezers done in Kentucky and wants to move that to Athens County. The company has tripled its sales in the past two years, according to the meeting minutes, and wants to continue that growth. It’s possible those potential hiring numbers have changed since the February meeting. It was also said at the February meeting, according to the minutes, that the company needs more office space and that one scenario being explored was to move their offices to a new office building and use the current building strictly for manufacturing. The Theisen Industrial Park building is owned by the Port Authority.